MarketPsych: Applying Behavioral Finance: Welcome Back, Fear. (I'm Yer Huckleberry). Welcome Back, Fear. (I'm Yer Huckleberry). And, oh, by the way... WHAT TOOK YOU SO LONG? For a moment there I entertained the notion that the collective human nature of the investing community had reached a higher plane of inner peace and tranquility, free from the materialistic worries that bedevil less enlightened souls. But the investing community has not attained nirvana. They just don't know what to do. I heard a financial news commentator ask a fair question today, "Why hasn't the market reacted to the debt ceiling crisis? Why hasn't there been a sell off?" The unsatisfying and tautalogical response that leapt to mind was, "Nobody's sold off because... nobody's sold off." It's a good old fashioned wild west showdown between the good guys and the bad guys. The fight had been coming for more than an hour's worth of movie time. 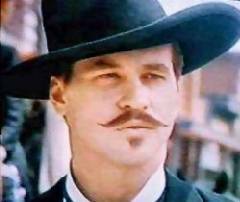 Marshall Wyatt Earp has had enough. Earp and his posse draw their guns and head down to the corral to confront the marauding Clanton gang. The outlaws caught by surprise, look up and immediate reach for their guns too. And then... nothing. Nothing but palpable tension ready to erupt in gunfire and an unbearably long staredown. Eight furious, frightened gunslingers with their fingers on their triggers looking at one another. The pressure builds and no one moves a muscle. KABOOM! Guns blazing! Bullets richocheting! Bodies flying! Total mayhem! Total AWESOME mayhem. No. "The Market" hasn't sold off simply because... it hasn't. But should the first frightened seller - of enough consequence to influence others -squeeze the trigger... it will cause another seller to do the same. Then another. And another. And then so many that the computers can't keep up. Gunfight. Rock slide. Stampede. Sell off. Same thing. So far, everybody's kept a cool head. The guns are in their holsters. Which is the way we like it 'round these parts. Peace and quiet. Law and order. No need to get twitchy now, stranger.